The use of stickers in advertising is not only an innovative way to attract attention, it is also an extremely cost-effective way to create a lasting impression. 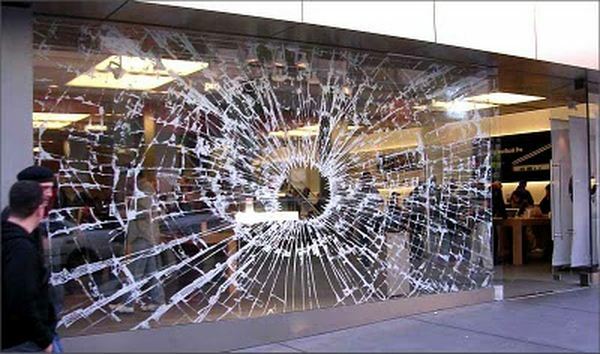 Many companies, whose only form of advertising is stickers, have seen an increase in business by as much as 550%. 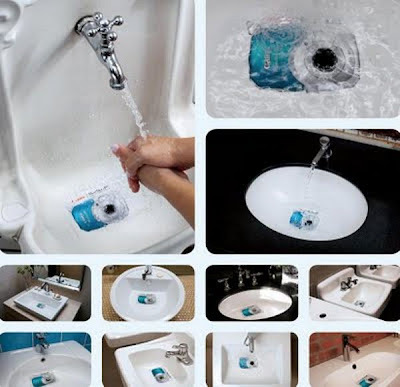 The great thing about these stickers is that they can be easily customized and this is probably one of the main reasons why they have become so popular. Here, we’ve collected some of the most attractive and creative use of stickers in advertisements by various companies from all over the world. You can also take a look at our previous collection of such creative stickers in advertisements - Part I. Le Cactus restaurant-bar communicated the burning effect of spicy wings by putting stickers featuring the face of a men screaming on the rear window of taxis. 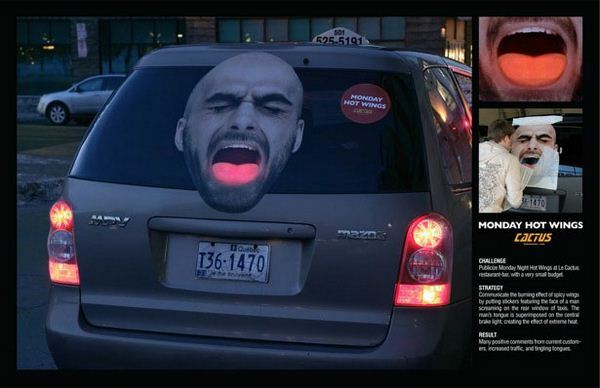 The man’s tongue is superimposed on the central brake light, creating the effect of extreme heat. 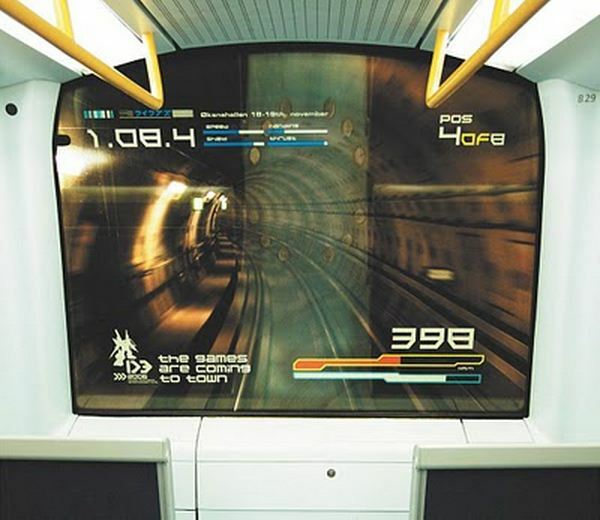 The sticker on the windscreen of the moving metro provided commuters with the experience of being part of a futuristic video game. Just like the games you would experience at the actual video game expo - D3. 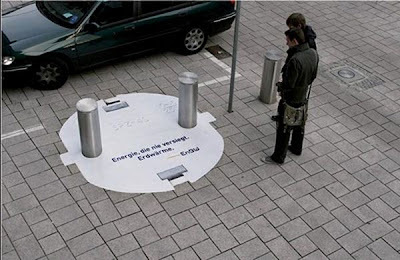 Silvery grey bollards were combined with the sticker on the ground to create an impression of a huge, realistic, three dimensional plug growing out of the ground. 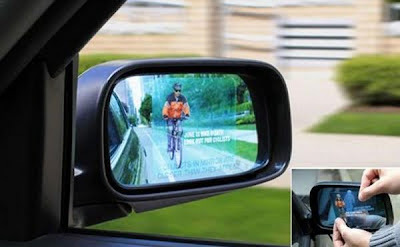 The stickers were attached to people's parking cars' side-view mirrors. The images show the terrain where only a jeep could go. 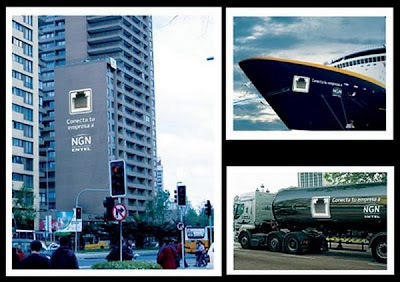 To facilitate the business sector to connect to the new telecom technology of Entel NGN, connector stickers were placed on buildings, trucks and ships with a text saying: Connect your company to NGN Entel. 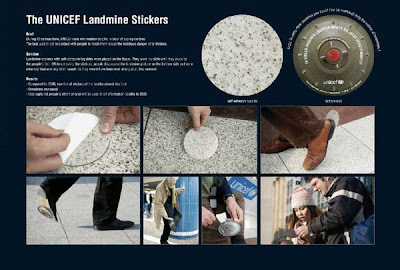 Stickers with the top image of a coffee cup were placed on top of steaming manholes. 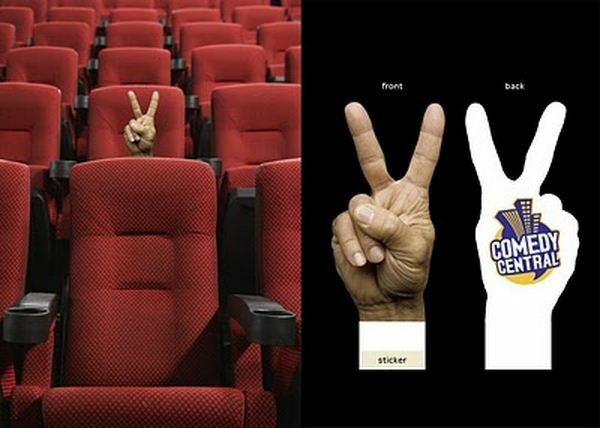 Stickers were placed on seats in cinema. 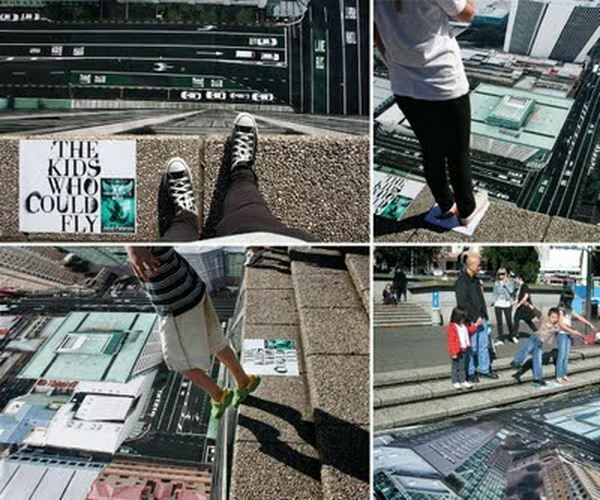 Surfboard shaped floor stickers were placed on moving walkways to promote Demolicion extreme sport magazine. 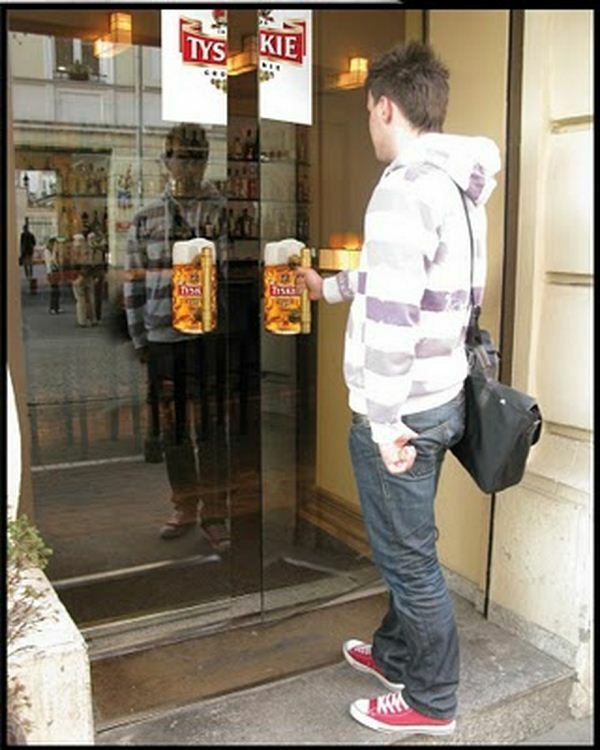 Cool stickers were installed behind doors of restaurants and shops as a part of an advertisement. 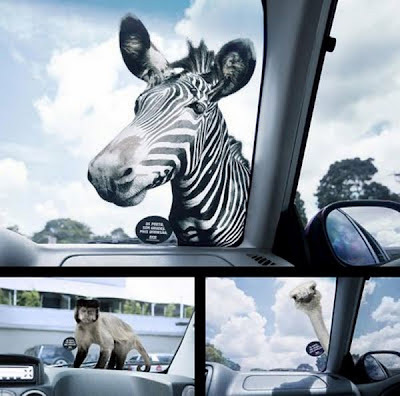 Stickers were placed on the windshield of the parked cars to promote Zoo Safari and to communicate that its unlike any other common zoo and similar to a safari. The stickers were created in the real life size proportions of the face of the animals taking a peek inside the car. This clever sticker advertisement was created to promote less driving and saving the polar animals. 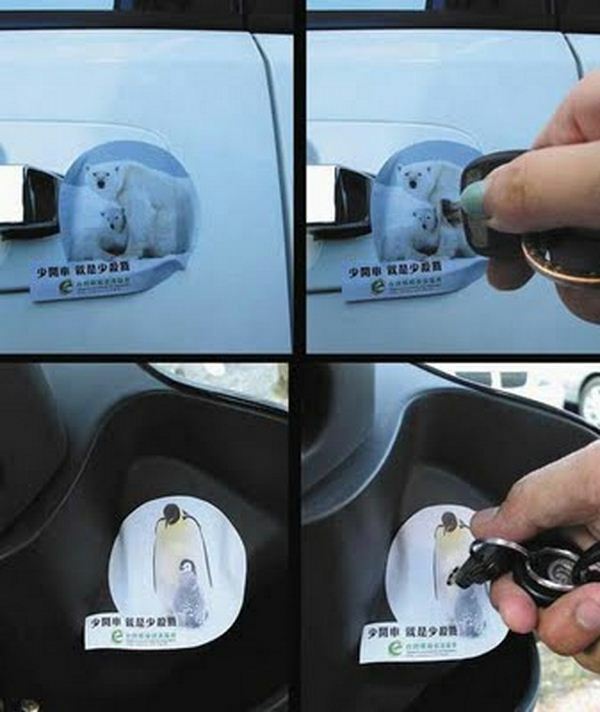 Polar animal stickers were placed right over the keyhole of the car doors; to open the car, the driver needs to insert the key through the sticker into the keyhole. A clever chairlift advertisement from 'Travel Alberta'. 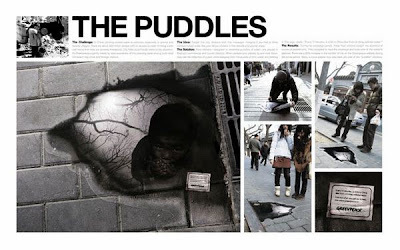 Several floor graphics imprinted with snow and mud were placed in various city streets. The drivers drove through this difficult road without feeling it; ahead a road signal that read "This is how it feels, Ford Ranger" was placed. To launch the latest book of Maximum Ride, large ground decals were created to show Aucklanders what it was like to stand on the edge of a building and jump. Sticker of a man's face was affixed on the elevator doors in corporate and residential buildings, in such a way that his hair was stuck on one door and the rest of his face on the other. And when the door opened, the hair pulled away. And another print that was affixed inside of the elevator showed the man bald. 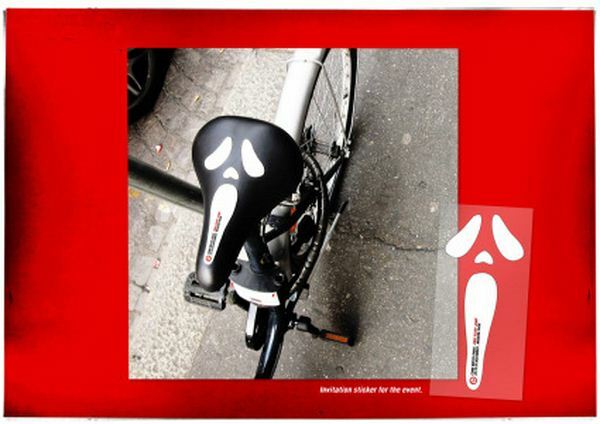 To promote the bike month, clear decals were placed on side-view mirrors of parked cars. 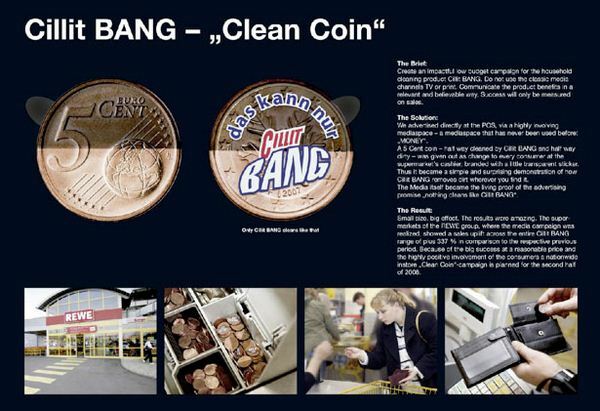 The househould cleaning product Cillit BANG placed transparent stickers on 5 Cent coins they gave out as change to consumers, that were half way cleaned by Cillit BANG and half way dirty. Floor Stickers that resembled puddles of water were placed on the streets of China to raise awareness of the huge problem of unsafe drinking water in China. Stickers were applied to the subway station pillars in order to make them look like life-size HomePlus supermarket stands. 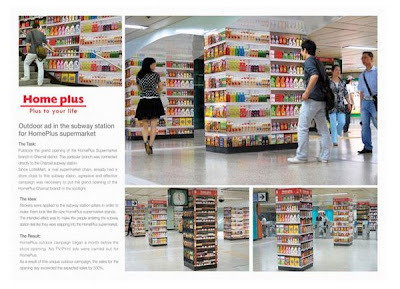 The intended effect was to make the people entering the subway station feel like they were stepping into the HomePlus supermarket. No TV/Print ads were carried out for HomePlus. 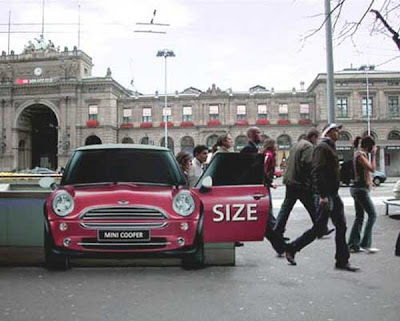 As a result of this unique outdoor campaign, the sales for the opening day exceeded the expected sales by 550%. 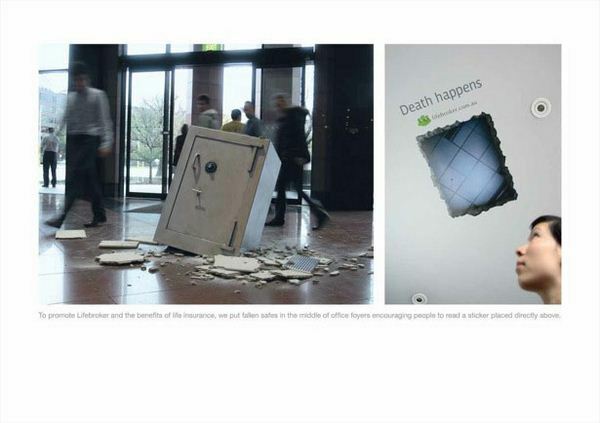 To promote Lifebroker and the benefits of life insurance, McCann Melbourne put fallen safes in the middle of office foyers to get people to read the sticker above. 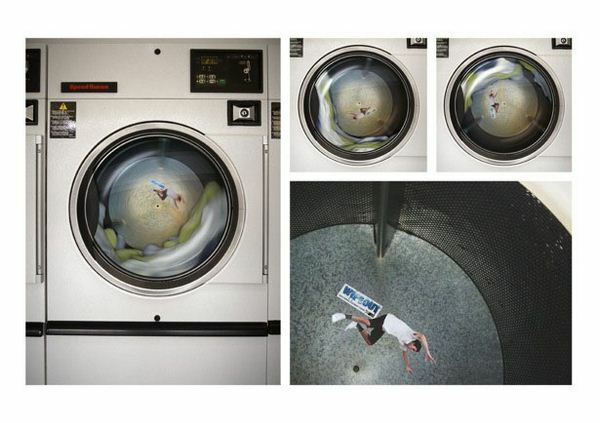 To promote Wipeout (a TV show where people wipe out on obstacle courses to win money) stickers were placed inside laundromat dryers to give people something to look at while they waited for their washing to dry. An crazy use of stickers to promote the brand. 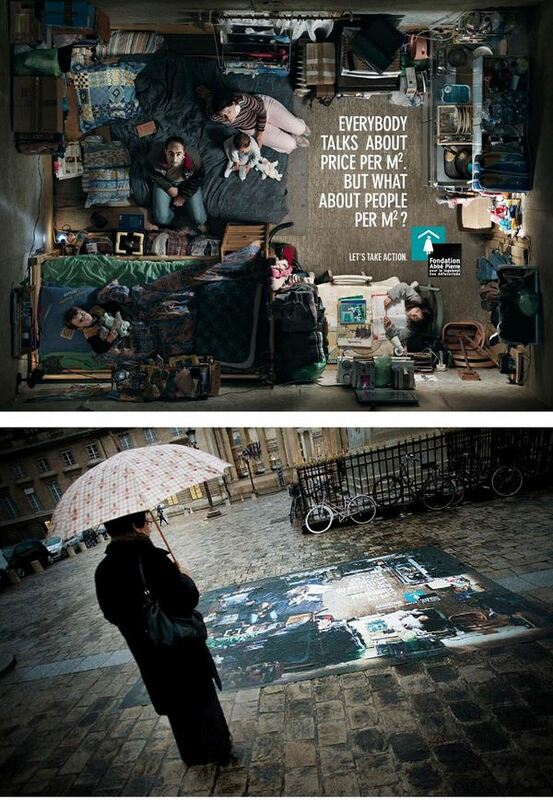 Sure will catch a lot of attention! 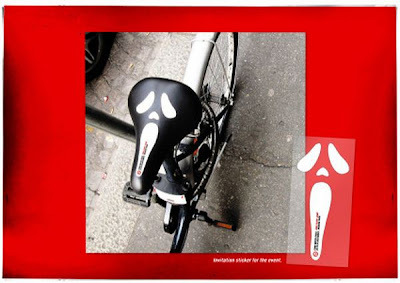 In Italy to promote an upcoming BMX event, these stickers were actually placed on bicycle seats that were parked on the streets. 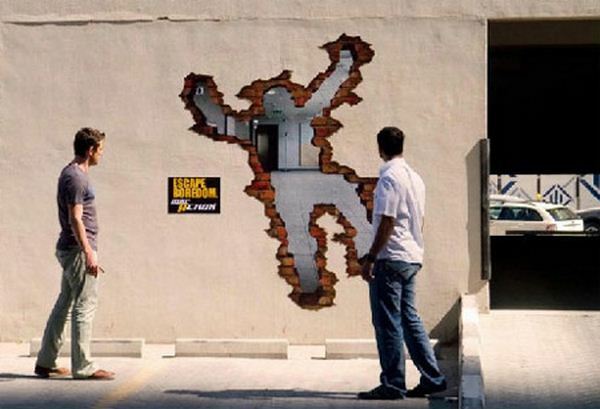 Brilliant sticker advertising campaign that won prestigious awards and drew in a lot of website traffic. 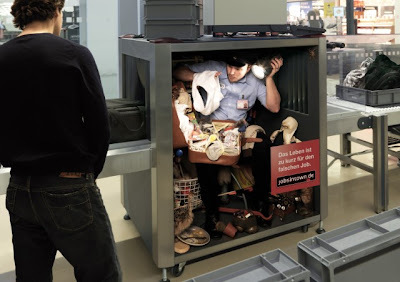 An advertisement for a job recruiting company in Berlin, Germany. It delivers the message that ‘Life is too short for the wrong job’. 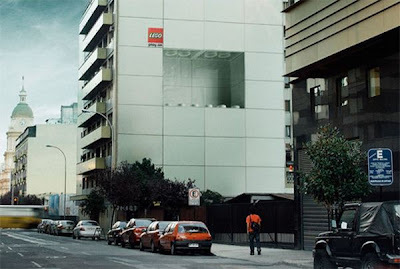 For more jobsintown ads - CLICK HERE. 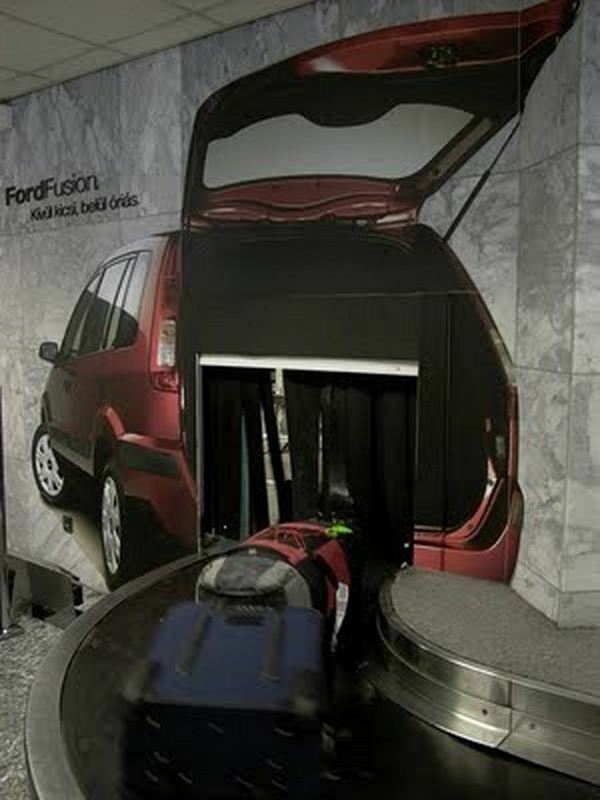 At the Budapest Airport's baggage claim, one's luggage comes out of the trunk of a Ford. This creative sticker was placed on the storefront window to promote and display the power of iPod HiFi. 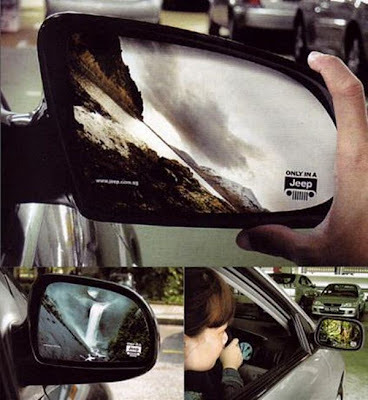 A creative advertisement uses windscreen sticker on the mirror of the locker rooms to give viewers a feel of them being in a Landrover. To promote its waterproof camera, stickers were placed in washbasins at shopping malls, restaurants and gyms.